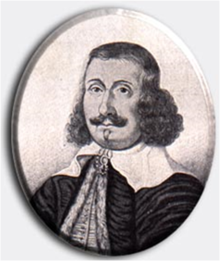 Francis Quarles (baptised May 8 1592, died September 8 1644) was a prolific English prose-writer and poet. He is now best known for his Emblems (1638) and other moral and devotional verse. Who lives unto himself, he lives to none. Esther (1621), Sec. 9, Meditation 9. Like twinkling Starres before the rising Sunne. Book I, no. 10, Epigram 10. Discharged, perchance, with greater ease than made. Book IV, no. 2, Epigram 2. Compare: "The longest way round is the shortest way home", Bohn, Foreign Proverbs (Italian). Anger, when it is long in coming, is the stronger when it comes, and the longer kept. Let the greatest part of the news thou hearest be the least part of what thou believest, lest the greater part of what thou believest be the least part of what is true. Where lies are easily admitted the father of lies will not easily be excluded. This page was last edited on 20 January 2018, at 19:37.